Waves crash into the south pier as a surfer gets ready to jump into the water. Unbelievable weather today for the week leading up to Christmas. 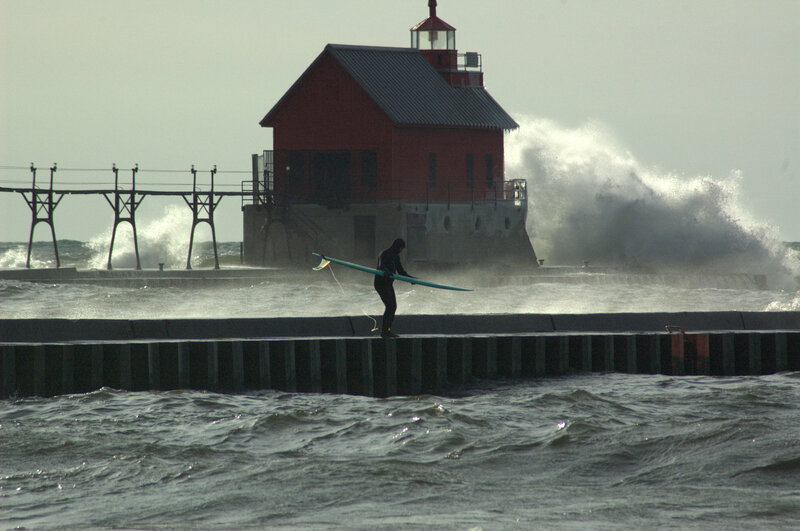 I was fortunate enough to get out at North Shore in Grand Haven where surfers and kiteboarders were soaking up the sun and ripping up the waves which were over head high at the end of the pier. Below are a few pictures from today that I hope gets everyone in the Christmas spirit! Have a safe and happy holiday. Michigan Dawn Patrol is a kiteboarding, surfing, and water sports photo and video blog focused on Michigan. This blog gives us something to do until the next wind blows! Comment, share, and subscribe if you enjoyed this post.